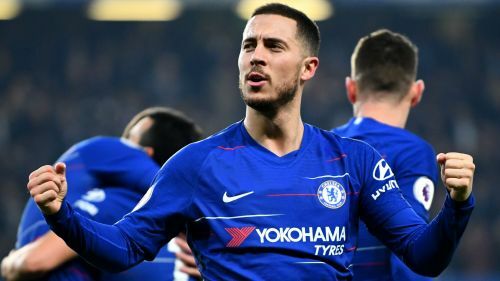 Eden Hazard remains focused on Chelsea, according to team-mate Willian, with Maurizio Sarri unconcerned by reports the Belgian could be a transfer target for Real Madrid. Zinedine Zidane's return to the Santiago Bernabeu has promoted fresh speculation Madrid could move for Hazard at the end of the season. Hazard's Chelsea contract is set to expire in 2020 and Sarri has previously urged the attacker, who has regularly hinted at his interest in joining Madrid, to make a decision over his future. Chelsea's situation is complicated by a two-window transfer ban while Madrid president Florentino Perez has indicated Paris Saint-Germain forwards Neymar and Kylian Mbappe will be targets to add to Zidane's squad, but Sarri will not lose sleep over renewed Hazard speculation. "I don't know. You'll have to ask Hazard, I think," Sarri told reporters. "At the moment, I didn't speak with Eden about Zidane, so I don't know. "I am not worried because you know very well my opinion: I want in my team only the players who want to play for Chelsea, so I cannot be worried." Left-back Emerson Palmieri has said Chelsea players are "afraid" of the prospect Hazard - who has scored 13 goals and set up a further 11 in the Premier League this season - could leave. Speaking ahead of the Europa League tie against Dynamo Kiev, Willian said Hazard has not spoken about his future with his team-mates. "It's a difficult question. First of all, I hope he stays with us," Willian said when asked about Hazard. "But in football, you never know what can happen. "Of course, Eden is a fantastic player, one of the best players in the world. He's my friend, one of the best players I've played with in my whole career. I just have to say I hope he stays with us. That's it. "No doubt, he's focused here. Of course, he wants to play, he wants to help us win something this season. He's never said something about Real Madrid or stuff like this. He just wants to continue to play for Chelsea."